I got a lot out of this meeting's presentation by Mark Hopper! His demos are always exceptional and this time was no exception. It was his take on what often is a dry academic topic: heat treating. First Mark went over the theory by drawing and reviewing a steel state chart (see below). I've seen these charts before, but they are usually temperature vs. carbon content. 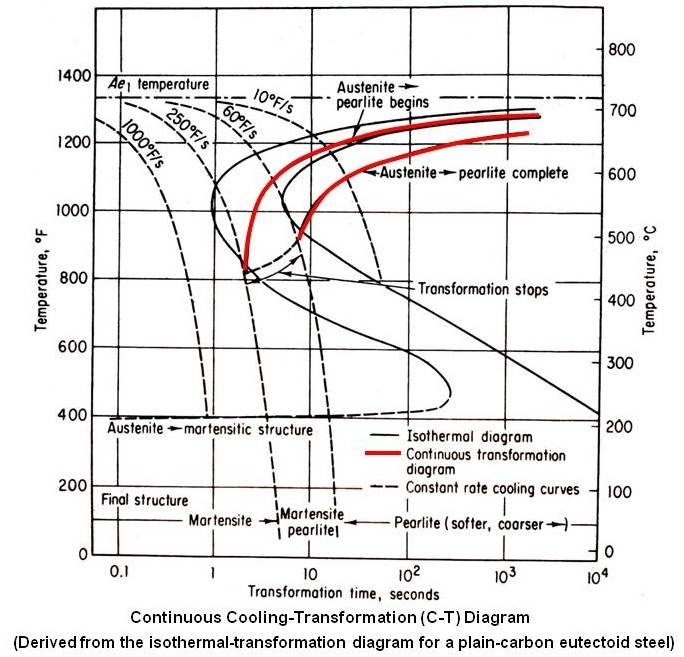 This one is temperature vs. time, showing how one typical kind of steel reacts. Most of this discussion focused on grain size, how that impacts steel toughness, and how to control it. The short answer is normalize it. Refer to the particular steel's manufacturer's data sheet to see specific recommendations for normalizing temperature and number of times to normalize it. Next was the fun part: exploring grain size base on how steel is quenched and how it is normalized. For this series of tests, Mark used O-1 steel soaked at critical temperature to grow grain size for this test. The same steel was normalized multiple times, and broken each time to expose the internal grain and gauge the difficulty of braking the steel. 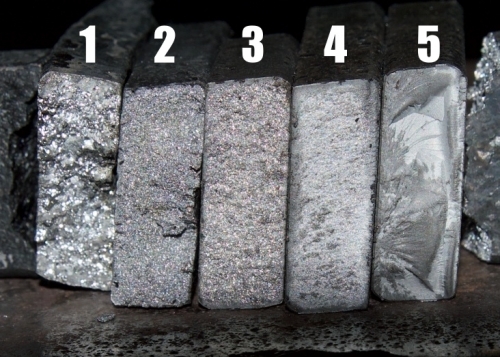 The details are summarized in the chart below, with pictures of the resulting grain size for each test. At the end of testing, the O-1 steel was tested with Rockwell Hardness testing files and determined to be harder than 65c Rockwell (theoretical limit for O-1 is 68c Rockwell). Key point: normalizing increases toughness without reducing hardness. Testing showed a total 10 points Rockwell C hardness change from no color (65c) to softest side (55c). Key points: once normalizing is complete, the tempering process can continue without rehardening, and quenching in the tempering process can occur in water, since the metal was not heated to critical. I was thinking step 5 "quenching" was going through a full hardening process (heating to critical, then quenching. But that's not what Mark did. This must mean plain old cooling it down. Especially since one of the key points he made of normalizing is that hardness is not affected by normalizing.